...when you are laughing and loving, you truly are living!" Offering yoga for all levels in a supportive, encouraging, safe and fun environment. 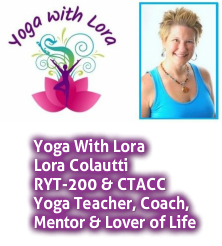 Yoga with Lora will help you feel good in mind, body and spirit. ... And you deserve to feel good! I look forward to seeing you in the studio!